Standing inside the ASICS Research Institute of Sports Science (RISS) outside Kobe, Japan, Nicole McCasey was fascinated by the science behind the design of athletic shoes, one of the sporting goods products she had been selling for years. After completing twelve marathons, McCasey understood how a seemingly lowly pair of shoes could make or break a race. 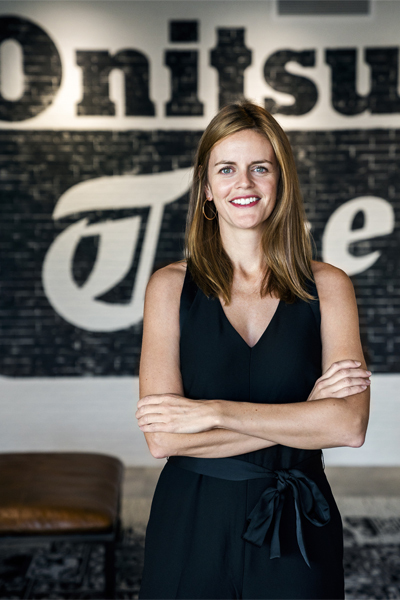 Now as the vice president of merchandising for ASICS Canada, she’s differentiating the brand as an industry innovator by applying new infrastructure and technology to brick-and-mortar stores that boost the consumer experience. As both consumer and company leader, McCasey is particularly proud of the mission to optimize sports performance. In fact, the company’s research and development laboratory shows how data collected on every nuance of every footfall informs the design of its running and athletic shoes, known for their capacity to both absorb shock and prevent injuries. And that scientific commitment to excellence is primarily what inspired her to join ASICS Canada in early 2017. Prior, she worked for Adidas in a business development position to build the company’s Canadian presence. By then, she had nine years of marketing and sales experience with two internationally known sporting goods companies, including two years spent in Korea developing leadership skills in marketing strategies for foreign markets. She was also well-versed in how the minutia of every product fed into the bigger marketing and strategy picture, as well as the technology that transformed that data into actionable decisions. Her earlier adventures seemed to have tailored her very specifically for the work ASICS had planned for her in Canada. Introduced in 1949 by Kihachiro Onitsuka, the shoeless, post-war children running around Japan inspired the first iteration of what would become an “ASICS” shoe. Onitsuka’s goal was to unite people through participation in happy activities, especially sports. Not content to sell just a foot covering, Onitsuka wanted to offer the best athletic footwear available that enhanced performance while reducing the risk of injury. The 1964 Olympics revealed the level of his success: forty-seven medal winners were wearing his brand as they crossed their respective finish lines. In 1977, mergers generated the newly christened ASICS, a Latin acronym of “A sound mind in a sound body.” Products, markets, and affiliates added in the decades since have cultivated high consumer confidence in the brand known for high-quality athletic gear. Today the company looks in part to its vice president of merchandising to equip it for market success in the years to come. By taking on a leadership role for ASICS Canada, McCasey returned to her home country to implement the company’s strategies to achieve ASICS 2020 goals: build its consumer base with enhanced direct-to-consumer activities and ensure customer satisfaction by providing brand consistency across all products. She was starting at ground zero; despite previously having a Canadian-based distributorship in place, as a market, Canada was still a wide-open territory. McCasey’s task was to develop that national market while doing business in it at the same time. As part of the new Canadian leadership team headquartered in Toronto, she hired two marketing professionals to help her, a merchandising manager and a director of business intelligence and demand planning. She also realized she needed an infrastructure; unlike at her previous positions, there were no existing processes in place that allowed the team to capture and use data to inform business decisions. To do so, technology was essential. “Data is the best driver of every decision,” says McCasey, who ensured that the data generated by every aspect of the enterprise—products, sales, marketing, revenues, expenses, profits, etc.—was recorded and parsed for insights and information. Technology also reveals external market trends and internal market successes. She studies post-sales data as rigorously as she does production data. McCasey and the team at ASICS Canada also established a physical foothold as the next critical step. Within her first eighteen months, ASICS had opened its flagship store on Queen Street in Toronto, and four other stores in Ottawa, Calgary, Winnipeg, and Niagara, giving new customers the opportunity to experience product quality firsthand. “We want to offer our Canadian consumers a purposeful product that has the innovation behind it to produce the best possible performance for the athlete,” McCasey says. Drawing on talent was also critical. Along with a few colleagues, she launched the “ASICS Women’s Collective” as a response to being a woman in the sporting goods sector—an industry historically dominated by men. As a gathering opportunity for both men and women, the Collective is designed to educate, empower, and engage all participants to achieve their best selves in every capacity. “The goal of the Collective is to harness both the power of the individuals and the team, and to serve as an engagement tool,” McCasey says. Looking back, McCasey sees her adherence to her primary merchandising principle. “Learn and know every aspect of your business,” she says. “Who and where your consumers are, every cost of every product, how every item translates into profits or losses.” She is involved in every element of every product, from product procurement to wholesale partners to sales successes. McCasey also knows she’s set the foundation to achieve the company’s goals. In conjunction with the parent company, brand awareness is rising. And she’s now developing the strategies needed to appeal to a larger market, including younger shoppers, as data reveals people are looking at yoga, cross-training, and other opportunities as crucial elements of their fitness regimens.